Let Launch in E. Brunswick, NJ make your kid's birthday the best birthday ever! We handle all the work so parents can enjoy the fun. Our hassle-free, off-the-wall birthday parties for kids are packaged to include a Launch party host, special gift for the birthday child, jump time, table time, food, drinks, and more! Rain or shine, don’t just bounce, LAUNCH! Launch yourself on our trampoline courts and see what it’s like to literally bounce off the walls. 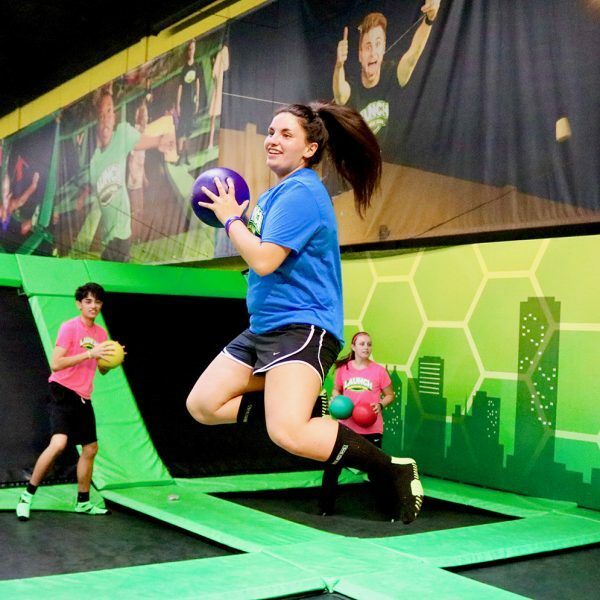 Experience all our trampoline attractions and defy gravity at Launch in E. Brunswick, NJ! Slam dunk just like an NBA star at Launch in E. Brunswick, NJ! This attraction brings together basketball and a trampoline, so you can jump right to the rim. Become the MVP among your friends by scoring the most points! Traditional dodgeball is fun, but at Launch in E. Brunswick, NJ we believe everything is better while defying gravity with friends. Our epic trampoline dodgeball arena features raised ramps and platforms and is sure to add a new level of fun, fitness, and teamwork to anyone’s day! Basketball at Launch in E. Brunswick, NJ isn’t just a team sport; you can play your friends one-on-one to see who has the better skills. Score your bragging rights today. What better way to learn new tricks than to land on a soft air bag, just like professional stuntmen use?! This attraction is fun for kids and adults at Launch E. Brunswick, NJ! Dreams become a reality as you fly, twist, soar and float through the air before landing in a giant pit of foam at Launch E. Brunswick, NJ! Our tumble traks are extra long trampoline beds that gymnasts and cheerleaders flip for! Come see how far you can tumble and flip at Launch E. Brunswick, NJ. Quit hanging around at home and come reach new heights… literally! At Launch in E. Brunswick, NJ, you can challenge yourself to reach the top of our Cliffhanger indoor mountain rock climbing wall! We have a variety of walls for all skill levels and all have options for a no-fear fall. Pick a team, gear up, and get ready to compete! Fury: A Laser Tag Experience, puts your gaming skills to the test in a real life battle. Our state-of-the-art arena transports you to a world where the Martian Syndicate is battling the United Earth for precious resources. Pick a side and defend your position at Launch in E. Brunswick, NJ. Have you ever dreamed about becoming a ninja warrior? Scale Launch in E. Brunswick, NJ’s state of the art Ninja Course which offers lanes that cater to different levels. Give your best shot conquering obstacles like the spider wall, trapeze, and the warped wall! Launch in E. Brunswick, NJ’s multi-attraction battle pit brings you several skill testing activities. Challenge your friends to joust on our battle beam or bosu balls and then test your balancing skills on our slackline, where one misstep lands you in the foam pit! Test your tight-rope balancing skills on Launch E. Brunswick, NJ’s slackline, where one misstep lands you in the foam pit! Escape reality and venture into a virutal world in Paradox. This next level system will transplant you into a life-like world and will test your mind and skills. Take the leap into over 100 virtual reality games at Launch in E. Brunswick, NJ! You are sure to raise your heart rate as you try to jump over and duck under the rotating arms in this awesome attraction at Launch E. Brunswick, NJ! This is the best ninja course around! The Adrenalator at Launch E. Brunswick, NJ takes you back to the days of American Gladiator. Race your friends through obstacles to see who can be the first to finish! Get your adrenaline pumping at Launch E. Brunswick, NJ as you free-fall from the 20-foot Stunt Tower into a giant airbag, just like a professional stuntman in the movies! The indoor playground makes Launch E. Brunswick, NJ a great place for things to do with little kids! Young children can climb, swing, slide and explore in a fun world that is made for their size and abilities! Take a break from the action and and feed that hunger! Fuel your fun at Launch Eats in E. Brunswick, NJ, where we’re serving up awesome pizzas, fountain drinks, slushies, snacks, ice cream and more! Have it how you like it! Whether it’s handmade pizza or one of our fresh salads, our food is all custom made from scratch with fresh ingredients, right in front of your eyes. Krave pizza is the best pizza in town, but don’t forget to save some room for our signature dessert pizza or create your own ice cream sundae with unlimited toppings! Launch E. Brunswick, NJ has all of the delicious food you need. Don’t worry, the fun never ends at Launch in E. Brunswick, NJ! Play some of the most popular games around in our arcade! Win tickets and redeem them for awesome prizes! This is not your typical maze! Feel like a top secret agent as you attempt to get through this laser maze without touching one of the laser beams that jut out from all angles! Check out this fun way to test your agility and see how well you can do dodging lasers as you race against the clock at Launch E. Brunswick, NJ. Look out for the turkey and challenge your friends to a fun game of bowling at Launch E. Brunswick, NJ! Our bowling alley is the best place around to get together for a night out after work or on a rainy day. V.I.P Time is a quieter, private time where Launch in East Brunswick is open exclusively to jumpers with special needs, along with their families. Pay for your jumper and 1 parent or guardian gets to jump along for free! Siblings are also welcome to attend. Launch into a fitter, healthier and happier you with Launch Trampoline Fitness! Launch Fitness is the most fun and challenging ways to get fit in the East Brunswick area. Low impact, high fun! Great for all abilities and fitness levels! Burn up to 1,000 calories an hour!